How To Filter Comments In YouTube ? It is sometimesyoutube-releases-native-software-for-watching-videos-in-mobile/"> more interested and sometimes it is more tortured when we look at the comments posted in YouTube. To come out of this trouble YouTube has tried many different ways to filter the noise, adding an option to mark comments as spam, voting comments, previewing comments before posting them but the results will be sometime how-to-download-youtube-videos-using-grab-browser/">more irritated. You can have extensions for Firefox, which can hide the undesirable search-google-in-reverse-order-funny-experience/">comments. Still you are so tired of the ignorant, prejudiced, and hate mongering. This is a new method for those who don’t want to install the extensions, YouTube has brought some advanced-youtube-search-options/">advanced options for comments. 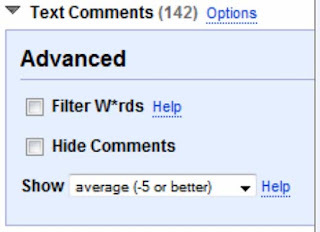 Therefore, you can hide the comments that include "how-to-filter-file-types-in-google-video-search-results/">coarse language and racial slurs" or hide all the comments. 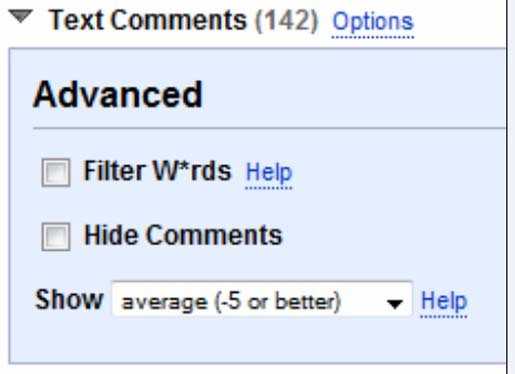 Just click on "Options" next to "Text comments" and filter the comments. One thing is sure that you can have a google-brings-feature-to-search-images-by-color/">different experience in YouTube.